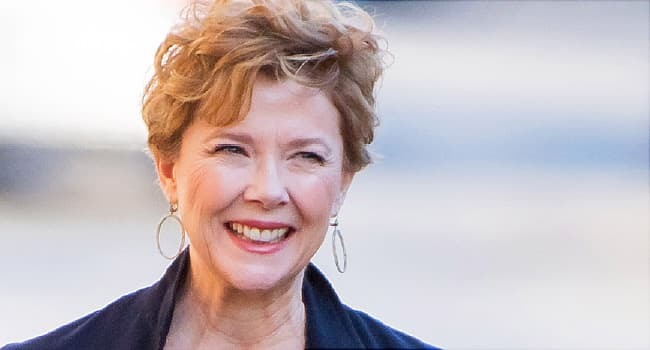 Annette Bening is not just famous for being a four-time Oscar nominee and longtime spouse of Hollywood legend Warren Beatty. She’s also known for being politely -- if firmly -- guarded about her personal life, even as she quietly works without fanfare to raise funds and further research for cancer and reproductive health. Her reticence clearly benefits her craft, so successfully does she disappear into the skin of her many memorable characters. From her breakout film role in 1990’s The Grifters to her latest star turn in The Seagull, which opened in U.S. theaters last month, she conjures women on screen who crackle with life, wit, rage, humor, and, yes, drama. But Bening’s own character is best revealed not through her acting, but her actions. When the cameras aren’t rolling, she’s a doting daughter to her elderly father and mother, who at 91 and 89, respectively, still lead active, independent lives in San Diego. She’s a devoted wife and mom, too, protective of both her enduring marriage to Beatty and their four kids ranging in age from 26 to 18. And she’s an advocate for health-focused organizations such as the Entertainment Industry Foundation and Planned Parenthood. Family planning -- when and whether to have children, having a safe pregnancy and birth, and receiving good postnatal care -- is central to reproductive health, yet this umbrella term covers a wide range of health issues that can affect both genders. According to the National Institutes of Health, reproductive health refers to the diseases, disorders, and conditions that affect the male and female reproductive systems during all stages of life. They include the diagnosis and treatment of birth defects, developmental disorders, low birth weight, preterm birth, reduced fertility, impotence, menstrual disorders, vaccinations, sexually transmitted diseases, patient education, LGBTQ services, and more. Bening has long supported Planned Parenthood, a nonprofit reproductive health organization with nearly 650 health centers across the U.S. In fact, the creative team behind her acclaimed 2016 film 20th Century Women -- whose storyline depicts two central characters visiting a Planned Parenthood clinic for a pregnancy test and a cervical cancer screening -- partnered with the organization during script development to accurately portray these scenes, and they even donated a portion of opening weekend ticket sales to the group. According to Planned Parenthood, its health centers have provided reproductive health care for more than 2.8 million American men, women, and young people -- and Bening has disclosed how she relied on Planned Parenthood as a young woman back in San Diego, before she hit it big. “Reproductive health is a very important thing for us all to stand up for -- not just women, but men, too,” she says. Her performance in The Seagull, a period drama based on the classic Anton Chekhov play about a fading Russian actress who feels threatened by an ambitious ingenue (played by Saoirse Ronan), underscores this assertion; only a middle-aged woman -- who truly looks middle-aged -- could authentically inhabit the part on screen. “It was a dream come true,” she says of the opportunity. Bening may not outwardly resist the years, but she does wear them well. The star attributes her slim physique and glowing smile to eating healthfully (with “a glass or two of wine in the evenings”), maintaining a positive attitude, doing lots of yoga (“I was lucky enough to be introduced to it when I was in acting class; its practice and study have been a huge gift in my life”), and inheriting a good set of genes. And, boy, did she ever: “My mother’s father lived to be 100,” she says. With her own parents, Arnett and Shirley, both in or quickly approaching their 10th decade of life, it seems centenarians may run in her family. And Bening says she’s learned many lessons about longevity from them. Bening’s odds of reaching a similar marker are higher because of her genetic inheritance, says Thomas T. Perls, MD, a professor of medicine at Boston University’s School of Medicine. Another longevity bonus, perhaps, for Bening? She gave birth to her youngest child, daughter Ella, who is now 18, at age 41. When it comes to motherhood, the private star finally lets down her famous guard. Her oldest child, Stephen Ira, a transgendered man now in his mid-20s, is a vocal activist for LGBTQ rights and a blogger who publicly chronicled his transition during his college years. When asked how his gender identity journey transformed not only her son physically and emotionally, but also her own outlook and ideas about parenting, Bening answers the question while resisting it in the name of privacy. With this gentle pivot, Bening shifts back to discussing acting. She names another upcoming project she’s excited about that comes out in September: Life Itself, a new film from the creators of the mega-hit TV series This Is Us, co-starring Oscar Isaac, Olivia Wilde, Samuel L. Jackson, and Antonio Banderas. The story spans multiple generations and follows a tribe of interconnected characters in New York and Spain; she plays a doctor. And with the focus back on her reel life, her real life remains safely behind the scenes. Bening doesn’t fear aging. Perhaps she’s so blithe about growing older because her maternal grandfather made it to 100, and her own active, healthy parents are just a decade away from achieving this same centenarian milestone. Healthy inheritance: Children of centenarians have approximately 60% lower rates of heart disease, stroke, diabetes, and hypertension, and 80% lower mortality in their early 70s, compared with others born around the same time. All relative: Siblings of centenarians have higher odds of reaching age 100, compared with others born around the same time. Pregnant after 40: Close to 20% of female centenarians had children after the age of 40, compared with 5% of women born in their same year, which suggests women who have children after the age of 40 have a four times greater chance of living to 100 or older. Delayed menopause: The average age of menopause is 51. Women who enter menopause later than this average may have a lower chance of having age-related diseases. Female factor: Women who live to be 100 greatly outnumber male centenarians. Perls’ research suggests women may be better at living longer with chronic illnesses that men don’t generally survive. Mentally sharp: Alzheimer’s becomes less common among centenarians relative to octogenarians (people ages 80 to 89 years old) and nonagenarians (people ages 90 to 99 years old). Centenarians, it seems, have a resistance to getting the disease. Interview, Annette Bening, March 2018. Thomas T. Perls, MD, professor of medicine, Boston University’s School of Medicine.